Cranial cruciate ligament (CrCL) injury is the most common cause of stifle lameness in the dog. CrCL deficiency results in both translational and rotational instability of the stifle joint that leads to the development of the degenerative joint disease. The joint pathology, including the complex of biologic and biochemical events that lead to ligament degeneration and the concurrent development of osteoarthritis (OA), has been coined cruciate disease. CrCL deficiency in dogs is a multifactorial disease involving genetics, conformation factors, and an inflammatory component that together create an imbalance between the biomechanical forces placed on the ligament and its ability to sustain these loads, eventually leading to rupture and joint instability. Biology and biomechanics are inextricably linked in health and disease of the CrCL, and it is vital to consider both aspects concurrently to develop a comprehensive understanding as well as medical and surgical therapeutic approaches to successfully manage this common cause of lameness in the dog. Simply put, this means that all of the tissues comprising the joint must function together, biologically and biomechanically, in order to maintain joint health and to allow full, pain-free function and range of motion. The CrCL cannot be isolated from the synovium, caudal cruciate ligament, articular cartilage, menisci, or subchondral bone, and all of these components must be considered critical interrelated elements, which are essential for long-term stifle function. A definitive cause for CRCL disease remains unknown, but many presumed factors result in a final common pathway of abnormal biomechanics and abnormal biology causing OA and the clinical signs of lameness, pain, and limb dysfunction. The biologic components include inflammation, degradation and degeneration, impaired synthesis, and turnover of extracellular matrix and necrosis. The biomechanical components include instability of various types and degrees, muscle weakness and dysfunction, misalignment, conformational changes, altered kinematics, and distorted joint contact areas and pressures. While many of these components have been incriminated as causes of cruciate ligament disease, evidence is lacking with regard to any one factor being a sole causal agent. For this reason, all of these factors should be considered as potential components of a multifactorial disease process. The precise role each plays in the process and the nature and timing of each event is critical to improve our understanding of cruciate disease so that we can improve preventative, diagnostic, and therapeutic strategies, and treatment options for dogs afflicted with cruciate ligament injuries. An excellent question with regard to the cause of CrCl injury is does cruciate disease result from abnormal biomechanics on a normal ligament, normal biomechanics on an abnormal ligament, or a combination of both? Currently, there is no definitive answer to this question. While acute, traumatic CrCl rupture occurs and is characterized by the absence of pre-existing degenerative signs (osteophytes, synovial hypertrophy, cartilage degeneration), other joint tissues are concomitantly affected (meniscal tears, multiple ligament injuries, bone bruising) such that the total clinical outcome is one of whole joint injury and damage. This type of injury is not representative of the majority of CrCl injuries in the dog. More commonly, cruciate injury includes a degenerative component (osteophytes, synovial hypertrophy, cartilage degeneration, periarticular fibrosis, subchondral bone sclerosis). This more common scenario implicates abnormal ligament biology as a driving force behind the eventual development of ligament failure; it does not exclude abnormal biomechanics as a primary force behind this abnormal biology. It is certainly possible that abnormal biomechanics initiates and perpetuates abnormal ligament biology sustaining a vicious cycle of stifle joint failure that is recognized as cruciate ligament disease. Current thinking has focused on conformation of the proximal aspect of the tibia as the major contributor to abnormal stifle biomechanics leading to CrCL failure. While one study has reported a significant difference in tibial plateau angle (TPA) between dogs with and without CrCL disease, data from multiple studies contradict this, and there is no definitive evidence that either TPA or patellar tendon-tibial plateau angle is a significant risk factor for cruciate disease in dogs. When either of these angles is considered high based on reference intervals in dogs, theoretical considerations suggest there are increased CrCL strain and an increased shear component of total joint force. Thus, these components may contribute to the process of organ failure, but do not appear to be primary causal factors based on current best evidence. Inherent instability is another potential abnormality that could be involved in the development of cruciate disease. Instability can be the result of dysfunction of passive stabilizers, dynamic stabilizers, or both. In the canine stifle, passive stabilizers include the cruciate ligaments, menisci, collateral ligaments, joint capsule, and articular contours. The dynamic stabilizers are primarily the quadriceps-patellar mechanism components and hamstring muscles, but also include other associated muscles and tendons. Collectively, all of the stabilizers work to help maintain stifle joint kinematics. It is naive to view and treat CrCL disease as a singular issue of cranial caudal instability. Whereas failure of any of the stabilizers can lead to loss of normal kinematics and stifle joint organ failure, compensation for failure of 1 stabilizer by others can occur so that functional kinematics can be maintained. Instability from various causes as well as anatomic abnormalities of all types, joint incongruity, neuromuscular problems, tissue composition abnormalities, and changes to articular contact areas and pressures all alter stifle joint kinematics and are responsible for cruciate disease. These may occur because of genetics, nutrition, single or repetitive traumatic events, activities and training, infectious or metabolic disorders, and/or various surgical manipulations of the limb. It is therefore imperative that these considerations are included in investigations to determine etiopathogenesis, diagnostic approaches, breeding plans, and treatments for canine patients. The nature and complexity of this multifactorial disease process invokes comparisons with canine hip dysplasia and elbow dysplasia. This combination of anatomic, biomechanical, genetic, cellular, and biochemical factors involved in CrCL disease in dogs could appropriately be considered as components of a stifle dysplasia complex. Developmental, infectious, immune-mediated, genetic, metabolic, hormonal, and primary cell and/or matrix disorders have been suggested as causal or associated factors in canine CrCL disease. Genetic components appear to be involved in certain dogs and may contribute to conformational changes associated with biomechanical causes of disease. Hormonal- and metabolic-related changes have recently been implicated in CrCL disease. Effects of early spay or neuter on growth plate function could contribute to conformational changes associated with cruciate disease. Cell and matrix disorders can involve a myriad of different tissues, processes, and mechanisms. The current major areas of focus are on the CrCL and its synovial sheath. A critical component to these disease mechanisms is that the CrCL is intra-articular but extra-synovial. This means that, in health, the CrCL is protected from the intra-synovial environment, and the intra-synovial environment is protected from the CrCL. Intra-synovial structures such as the articular cartilage, synovium, and menisci constantly communicate with the CrCL, but this communication is filtered by the synovial sheath. When this protective filter is lost, as it is in cruciate disease, the CrCL is exposed to the intra-synovial environment and tissues, and vice versa. Whether this exposure is of biological or biomechanical cause or both is not known, but it is clear that this does occur in the disease process and that it can have severe consequences for both ligament and joint health, including upregulation and release of inflammatory mediators and degradative enzymes, proliferation of cells, recruitment of inflammatory and immune system cells, and production of anti-collagen antibodies in many cases. Abnormal biology and biomechanics definitely potentiate and exacerbate one another. Instability, anatomic abnormalities, muscle weakness, and altered contact areas and pressures can directly lead to inflammation, necrosis, and tissue degeneration. Tissue composition changes, cellular responses, and degradative enzyme production and release can directly result in altered kinematics, neuromuscular dysfunction, and malarticulation. Some of these competing forces result in positive responses that help to ameliorate or retard the detrimental effects of the other abnormal processes. Osteophytosis, muscle hypertrophy, and periarticular fibrosis are biologic responses that help counteract abnormal biomechanics because of dysfunction of passive stabilizers, tissue loss, and anatomic abnormalities. Articular and meniscal cartilage as well as subchondral bone can remodel to help compensate for changes in tissue structure and architecture from abnormal matrix turnover. Unfortunately, these adaptations do not appear to be sufficient to allow for healing or even functional compensation for the associated abnormal biology and biomechanics of the CrCL. Cruciate disease in dogs involves a spectrum of potential causal factors, patient types, clinical presentations, risk factors, disease mechanisms, and rates of progression. Treatment strategies should address abnormal biology and biomechanics with the overall goals of decreasing pain, improving function, and retarding disease progression. Although there is not a currently available methodology for restoring joint kinematics to normal in dogs with cruciate disease, it is clear that addressing craniocaudal instability alone will never be sufficient for full return to long-term function. The strategies that have supporting evidence as potential aids in augmenting the productive responses outlined above include joint lavage, complete assessment of joint pathology with comprehensive and accurate debridement, pharmaceutical and nutraceutical interventions, and physical rehabilitation modalities. Whereas none have sufficient evidence in support of blanket statements regarding their use, joint lavage, or washout, has been reported to provide benefits in terms of dilution of nociceptive, inflammatory, and degradative mediators. The utilization of platelet-rich plasma (PRP) is a new technology, which focuses on enhancing the healing response after injury of different tissue types. In recent years, several studies have described a complex regulation of growth factors for normal tissue structure and reaction to tissue damage and have demonstrated an important role for growth factor application in the healing of damaged tissue. PRP is a natural concentrate of autologous growth factors (platelet derived growth factor, transforming growth factor, platelet derived epidermal growth factor, vascular endothelial growth factor, insulin like growth factor, fibroblastic growth factor, epidermal growth factor) and cytokines, which aids in the regeneration of tissues with low healing potential. Platelets have a major role in the initiation of wound healing. They adhere, aggregate and release numerous growth factors, adhesive molecules and lipids that regulate the migration, proliferation, and function of fibroblasts and endothelial cells. PRP has been shown to accelerate tissue repair in soft tissues via mechanisms involving the further synthesis of signaling proteins that participate in cell mitosis and angiogenesis. Another important consideration is that in addition to stimulating the growth of new tissue, PRP application has been shown to decrease pain and inflammation in the degenerate area in which it is applied. The utilization of PRP has the capacity to optimize the healing environment. Because of its autogenous origin, easy preparation and excellent safety profile, PRP has tremendous potential to speed recovery in cases of tendon, ligament, muscle, and cartilage disorders. As all of these tissues are compromised to varying degrees in cases of cruciate ligament disease, the administration of PRP has the ability to improve stifle stability, diminish pain, and accelerate physiologic healing and reparative tissue processes involving the patellar tendon, cruciate ligament, and meniscus. The incorporation of PRP into the medical protocol for management of cruciate ligament pathology may affect the current debate regarding the debridement and removal of partially injured cruciate ligaments and menisci given its ability to stimulate healing in these notoriously refractory tissues. Full exploration and assessment of the joint increases the likelihood of accurate and complete diagnosis of degree of synovitis, articular cartilage damage, meniscal pathology, and cruciate ligament pathology. Debridement of damaged and pathologic meniscal tissue can improve joint biomechanics, ameliorate pain, help to minimize further articular cartilage loss, remove a potential source of inflammatory and degradative mediators, and help prevent subsequent meniscal pathology. Therefore, complete debridement of diseased cruciate ligament may act to remove a nidus of inflammation and degradation, remove a potential source of pain, and improve observation and access to the menisci. Medications can have beneficial effects on inflammation, degradation, nociception, and synovial fluid rheologic and biologic properties. Physical rehabilitation can improve range of motion, muscle mass, and weight-bearing function in dogs with CrCL disease. These factors used in conjunction can augment the positive adaptational responses noted in canine CrCL disease, and some anecdotal evidence suggests that they may obviate the need for stabilization procedures for certain cohorts in the CrCL disease spectrum of patients. Certainly, these components should be considered for inclusion as part of a comprehensive management plan for all patients and clients. In conclusion, canine CrCL deficiency is a whole-joint disease, which should be considered organ failure in most affected dogs. Patients with CrCL disease are fighting biological and biomechanical factors that induce and perpetuate osteoarthritis and the clinical signs of pain, lameness, and limb dysfunction. An unstable joint is thought to initiate cartilage damage and the subsequent degradation and inflammation disease mechanisms characteristic of secondary OA. Whereas biomechanics may be involved, the biology of intra-articular structures, including the metabolism of synovium, adipose tissue, tendon, and ligament, may also contribute to the initiation and progression of OA. Diseased CrCL is one possible contributing factor that is easily removed at the time of surgery. The normal CrCL is intra-articular but extra-synovial so that direct exposure and communication to synovial fluid and other joint tissues does not occur in health. Current evidence suggests that pathology of the synovial lining of the CrCL and exposure of ligament to the joint environment could be early events in canine cruciate disease. This evidence lends further support to the theory that the CrCL may be one of the primary initiators and perpetuators of OA and for this reason CrCL debridement deserves careful consideration as a component of comprehensive treatment. With the introduction of proximal tibial osteotomies (TPLO, TTA) for the treatment of cruciate disease, recommendations have been made to perform small arthrotomies for meniscal release alone, perform arthrotomy or arthroscopy with or without debridement of the CrCL or meniscal release, and avoiding exploration of the joint altogether. Some of these approaches leave the CrCL in the diseased joint and exposed to the intra-articular environment. Whether to provide complete debridement of the CrCL at the time of surgery or to leave the ligament in situ is debated among surgeons because the current best evidence in the literature neither clearly supports nor unequivocally dismisses the need for ligament debridement. Ligament pathogenesis is the complex series of events that change a normal, healthy ligament into a diseased, nonfunctional, and potentially torn ligament. Resulting changes have been evaluated in both the ligament cells as well as extracellular matrix and characterized on molecular, biochemical, histological, and gross levels. Many of the degradative molecules thought to be responsible for ligament pathogenesis are the same molecules that are known to be involved in the initiation and progression of OA. These molecules may have the potential to diffuse from the ligament and synovium into the synovial fluid in sufficient concentrations to contribute substantially to the overall disease process. The amount of matrix metalloproteinases (MMP) released and the time frame of exposure needed to produce disease in the ligament and other joint tissues is not completely understood, but both ligament and synovium appear to be contributors to synovial fluid MMP concentrations. It is very possible that MMP from CrCL could be involved in the initiation of OA in cruciate disease in dogs. There are numerous studies that implicate MMPs in ligament pathogenesis. Collagenases have been identified in CrCL at both the gene and the protein level. Gelatinases have also been characterized in a similar manner as have cathepsins and other related degradative enzymes. If these degradative enzymes can be released when ligament tissue is exposed to the joint environment, then they could play important roles in osteoarthritic processes in addition to enhancing further ligament degeneration. Also, if these molecules contribute to OA, then removal of ligament remnants may ameliorate disease progression. Some studies support the theory that intact and partially torn ligaments left within the stifle joint and exposed to the intrasynovial environment may serve as a nidus of degradation. While it cannot be definitively concluded that ligament is the major intra-articular structure contributing to the release of these enzymes, diseased ligament is, however, one potential contributing factor that can be easily removed through debridement at the time of surgery. This provides some initial evidence supporting complete debridement of the CrCL as a component of comprehensive treatment of cruciate disease in dogs. The variables in favor of debridement include removal of the inflammatory and/or degradative nidus and elimination of ligament nociceptors. Additionally, removal of the ligament improves examination, probing, and access to menisci. The variables against debridement include preservation of ligament mechanoreceptors and proprioceptors, avoidance of morbidity to other joint structures during debridement, and potential maintenance of some CrCL function. The difference observed between normal and intact ligaments suggests that large amounts of MMPs may be produced during the process in which normal ligaments become diseased. CrCL remnants exposed to the intra-articular environment have the potential to release degradative enzymes known to be involved in the initiation and progression of OA and debridement of these remnants as a component of treatment for cruciate disease in dogs deserves consideration. None the less, a separate study evaluating the subjective arthroscopic appearance of CrCL that were left partially intact at the time of surgery in a numerous canine patients treated by tibial plateau leveling osteotomy suggested that CrCL tissue remained visibly intact over a range of postoperative evaluation time points. Additionally, there was a decreased incidence of meniscal injury and articular cartilage damage associated with leaving the ligament intact. Unfortunately, no data regarding the functional capabilities of these CrCL or the status of their cell and matrix composition or activities was provided and all peer-reviewed studies, which have examined these factors, have reported that functional healing does not occur, degradation and degeneration inevitably progress, and that subjective appearance of the CrCL is a poor indicator of disease status. It is obvious, however, from these two studies that additional research needs to be performed before firm recommendations regarding the removal of CrCL remnants can be made. What is known, however, is that CrCL remnants exposed to the intra-articular environment have the potential to release degradative enzymes known to be involved in the initiation and progression of OA and debridement of these remnants as a component of treatment for cruciate disease deserves consideration. The presence of different tissue types and their superimposition limit successful diagnostic imaging of the stifle joint with a single modality. Radiographic signs of cruciate ligament disease include intraarticular swelling, cranial displacement of the tibia in the mediolateral view with tarsal flexion applied, and in chronic cases, OA changes. The tibial compression stress radiograph has been reported to be useful in the diagnosis of partial CrCL rupture. This radiographic projection requires the stifle to be in 90 degrees of flexion with manual flexional forces applied to the tarsus. Flexion of the hock joint allows the tibia to move cranially, so it can be evaluated with during this stress view. Ultrasonography is useful for assessing cartilage abnormalities, meniscal tears as well as muscle, tendon, and ligament abnormalities. Diagnosis of CrCL rupture can be made by demonstration of the fluttering edges of the ruptured ligament. If the infrapatellar fat pad obscures observation of the ruptured CrCL, saline solution can be injected into the joint to create an anechoic window. OA changes appear as hyperreflective regions with irregular borders on the bone surface. The entire meniscus, however, is difficult to observe. Normally, the meniscus is inhomogeneous and congruent with the margins of the femoral and tibial condyles. Meniscal injury results in hyperreflective with hyporeflective areas that are irregular in shape and displaced. There are substantial limitations to the routine use of ultrasound in evaluating the stifle joint. Ultrasound images generally have low resolution and soft tissue contrast, which may make other imaging modalities such as MRI more useful. The major advantages of MRI are its excellent image resolution, superior soft tissue contrast, acquisition of images in any plane, and use of a magnetic field rather than ionizing radiation. MRI evaluation of the internal architecture of the stifle joint affords many advantages over arthroscopy or arthrotomy and is the primary imaging modality when assessing for cruciate, meniscal, and articular pathology in people. Because the stifle is a complex joint with various tissue types, differing image planes and sequences are typically used for complete evaluation. As mentioned previously, CrCL rupture is the most common cause of stifle OA in dogs and is frequently associated with damage to the medial meniscus. Complete evaluation of the menisci is impossible even with arthrotomy or arthroscopy because of anatomic constraints. Using either technique, the tibial surface of the menisci remains hidden from view, as does the integrity of internal meniscal structure. Additional meniscal surgery after surgical stabilization for CrCL deficient stifle joints may be needed because of undiagnosed meniscal pathology at the time of the initial surgery. Therefore, avoiding invasive inspection and handling of unaffected menisci at time of CrCL stabilization probably results in decreased postoperative morbidity, reduced incidence of surgically related complications, and less progression of osteoarthritis. However, missing a meniscal tear has been reported to result in persistent or recurrent lameness after CrCL stabilization, highlighting the need for accurate diagnosis of meniscal integrity at surgery. Because most meniscal tears are treated surgically, any positive MRI finding would result in an invasive intraarticular procedure to confirm the tentative diagnosis and to perform subtotal meniscectomy. Therefore any diagnostic test that replaces invasive inspection of the menisci has to be highly sensitive to reduce the incidence of late meniscal tears, and at the same time it must be of reasonably high specificity, because any false-positively scored meniscus will be inspected surgically, undoing the potential benefit of noninvasive preoperative diagnostics. In a recent study, low field MRI did not reach anticipated diagnostic accuracy for meniscal tears. The primary interest of this study was in evaluating low field MRI as a preoperative, noninvasive screening tool for triage of stifles as affected by meniscal tears requiring further invasive meniscal inspection and probably meniscal surgery and those where meniscal pathology could be excluded, preventing unnecessary invasive procedures. Currently, we cannot recommend low field MRI as a highly sensitive screening tool for meniscal tears in the context of CrCL surgery. Although less expensive and potentially more cost effective, low-field-strength MRI systems suffer from several technical limitations, including long acquisition times, poor signal-to-noise ratio, inability to obtain thin slices, and poor spatial resolution. The trend toward increased magnet strength (at least 3.0 T) to improve signal to noise ratio has continued in veterinary medicine despite increased purchase as well as cryogen and maintenance costs, because of the superior resolution and shorter scan times in an attempt to overcome this diagnostic dilemma. As mentioned previously, progressive degenerative joint disease may contribute to ligamentous deterioration and precede actual ligament rupture in clinical cases of CrCL rupture in dogs. In both clinical cases and in experimental models of CrCL rupture in dogs, the location of the MRI lesions is typically the intercondylar fossa of the femur and in the intercondylar eminence of the tibia. This is thought to be in part related to abnormal stresses born by the remaining caudal cruciate ligament and subsequent sequellae in the cancellous bone subchondral region associated with its origin and insertion. Early detection of theoretical pre-CrCL rupture lesions by stifle MRI evaluation may therefore afford surgeons an early opportunity to intervene medically before subsequent anticipated CrCL rupture. With CT technology, images can be manipulated, with a computerized process known as windowing, to reveal various structures based on tissue characteristics. Clinical advantages of using multidetector helical CT scanners include improved patient safety, enhanced accuracy and most strikingly, the ability to perform 3D image reconstructions with the option of creating surgical models to plan surgery for complex cases. In a recent report of CT Arthrography to assess intraarticular structures in dogs with naturally occurring stifle CrCL dysfunction, sensitivities and specificities were 96–100% and 75–100% respectively for the identification of CrCL rupture. In the same report, however, reviewers were less adept at discriminating torn meniscal fibrocartilage, with sensitivities of 13.3–73.3% and specificities of 57.1–100%. The key to successful management of the diagnostic options available is to have a thorough understanding of the anatomy and tissue properties of region being imaged and to recognize the strengths and weaknesses of the modality being selected. Ultimately, a multimodality approach will likely provide a complete assessment of complex structures using the strengths of each modality to exploit the tissue characteristics of the structure being imaged. Dogs with CrCL insufficiency frequently sustain damage to the caudal pole of the medial meniscus. Arthroscopy can be considered a highly accurate diagnostic tool, although meniscal tears might be overlooked, especially those that do not reach the surface and those on the tibial side of the menisci. This highlights the importance of thoroughly probing both sides of the menisci when performing arthroscopy. Using a stifle distractor to improve observation and probing of the medial meniscus is believed to further increase diagnostic accuracy. Historically, total, partial, or segmental meniscectomy has been recommended as treatment for these meniscal tears. Persistent or recurrent lameness after CrCL stabilization has been attributed to meniscal tears missed on direct inspection either using arthrotomy or arthroscopy during joint stabilization and reportedly occurs in 6.3–17.4% of operated stifles. Such tears are referred as latent meniscal tears in contrast to postliminary meniscal tears which are thought to develop despite surgical stabilization of the CrCL deficient stifle. Treatment is directed at removing the torn parts of the meniscus and has an overall good prognosis. However, the additional surgery necessary to perform meniscectomy increases the risk for surgical complications, results in additional owner cost, and delayed treatment of the meniscal tear may lower the overall functional outcome after CrCL stabilization. Resection of the torn meniscus ameliorates pain and improves short term function; however, meniscectomy accelerates progression of degenerative joint disease in the CrCL deficient stifle. Although total meniscectomy and segmental meniscectomy result in supraphysiologic intra-articular contact pressures and articular cartilage damage, meniscectomies are still commonly performed in dogs. Conservative excision of damaged meniscal tissue by partial meniscectomy when appropriate has been recommended. To preserve meniscal function and mitigate progression of DJD, meniscal tears are often repaired in people. Meniscal repair has been described in dogs but is infrequently performed. Evaluating the ability of meniscal repair to restore meniscal function compared with partial meniscectomy would be important to help determine whether or not meniscal repair should be considered in dogs. Meniscal repair is unlikely to be beneficial if the repaired meniscal parenchyma is degenerate and has lost its internal architecture. Torn meniscal tissue that has lost its normal structure and mechanical function is unlikely to regain normal function. A recent study evaluated the mechanical behavior of meniscal tears in dogs and found that non-reducible bucket handle, flap, and degenerative tears each caused a 45% increase in peak contact pressure (PCP). Although the meniscal parenchyma of degenerative tears and flap tears is macerated, necessitating resection of the damaged tissue, vertical longitudinal tears and bucket handle tears with healthy meniscal tissue may be amenable to repair. Repair of suitable meniscal lesions in people improves joint contact mechanics. It is anticipated that repair of reducible bucket handle tears of the medial meniscus in dogs could restore the biomechanical function of the meniscus. Conserving meniscal tissue would be advantageous because degeneration of femoral and tibial articular cartilage is proportional to the amount of meniscal parenchyma excised. Unfortunately, the meniscal parenchyma of the axial portion of bucket handle tears in dogs with CrCL insufficiency often has disruption of normal structure and material properties because the meniscus has been damaged from chronic impingement between the femoral and tibial condyles. Crushing of the meniscal parenchyma of bucket handle tears has been shown to result in an increase in PCP. Repair of chronic tears cannot be recommended because the material properties and geometry of the meniscus would be expected to be disrupted in chronic tears. Results from a recent study suggest that meniscal repair be considered for acute meniscal tears. Suture repair in dogs in this study reestablished normal PCP whereas partial meniscectomy caused a 55% increase in PCP. The repair techniques evaluated restored normal contact mechanics to the medial compartment of a stifle with a medial meniscal tear whereas partial meniscectomy caused a 35% decrease in contact area (CA), a 57% increase in mean contact pressure (MCP) and a 55% increase in PCP. Until further mechanical studies are performed on meniscal suture techniques in dog menisci, this particular study recommends a vertical or cruciate suture repair in order to prevent subsequent articular cartilage damage. Additional studies to assess the efficacy of meniscal repairs to alleviate pain and to potentiate successful healing need to be performed. Based on current results, consideration should be given to repairing peripheral tears involving the vascular zone of the meniscus if the parenchyma of the axial portion of the meniscus is normal. Partial meniscectomy should be considered for axially located tears and degenerative tears. Further work is needed to determine the optimal repair technique that should be used clinically in dogs based on fixation strength and ease of application. Cranial cruciate ligament deficiency in dogs is a common and costly problem for which there are multiple treatment modalities. Whereas numerous techniques have been investigated, none have proven optimal in terms of technical ease, associated costs, prevention of secondary pathology, complication rate, complication types, or mid to long-term outcomes. No one technique for treatment of CrCL deficiency has been shown superior to others in terms of functional outcome. Surgical techniques for correction have focused on intraarticular repair, extraarticular stabilization, or osteotomy of the proximal tibia. In spite of the innumerable studies performed comparing the techniques currently available, none of the techniques have consistently exhibited superiority for clinical efficacy making technique selection the surgeon’s preference. Technical modifications of the classic lateral suture stabilization (LSS) technique reflect changes in suture material, knotting, and attachment sites. Placing the suture caudal to the lateral fabella and curving distally to a drill hole in the proximal tibial crest has been the established technique but recently, attachment points craniodistal to the fabella and caudoproximal to the tibial tuberosity at the proximal aspect of the tibial plateau have been reported. These modifications are thought to improve suture isometry and thus overall impact on functional outcome after LSS. In addition, when assuming some degree of anisometry regardless of the exact type of LSS performed, loop tension pattern during range of motion might be related to the angle of stifle flexion at the time the suture is tied. In a recent study of LSS attachment sites, results indicated that irrespective of the precise point of lateral suture attachment, substantial changes in suture tension occur during a full range of stifle motion. This change in tension increases significantly with joint flexion. The study also found that tightening the suture with the stifle in 70 degrees of flexion results in the most even tension pattern within the lateral suture loop, but stabilizing the stifle using LSS at a flexed angle would probably allow persistent joint instability, as the suture loop tends to loosen at joint angles between 70 degrees and 160 degrees. When interpreting tension within a lateral suture used to stabilize the CrCL deficient stifle, two aspects should be considered. First, any disproportionate increase in suture tension would increase the risk of premature suture failure, or if the suture does not fail, stretching of the suture loop might occur. Secondly, very high tension within the suture will probably over-constrain the joint, whereas a substantial loss of tension within the suture will certainly result in some degree of joint instability. For optimal tibial fixation, some studies suggest attaching the suture at a point just caudal or cranial to the digital extensor groove, at the most proximal aspect of the tibial plateau. However, using a bone anchor on the lateral condyle and a divergent drill tunnel just cranial to the digital extensor groove (LSS4) resulted in the highest peak to peak load (PPL) and maximal peak load (MPL) among four techniques recently investigated. Passing the suture around the lateral fabella instead of using a bone anchor at the lateral femoral condyle might allow for some soft tissue movement, potentially reducing high strains within the suture, but relaxation of the fabellofemoral ligament might occur in the long term, resulting in loosening of the LSS and recurrent joint instability. Based on data from this recent study, LSS2 might be the preferred method when attempting to stabilize the stifle with a lateral suture, as this method consistently resulted in the least change in suture tension. Even though LSS2 is only a slight modification of the traditional technique popularized by Flo, omitting the lateral branch of the suture loop may improve isometry. None of the 4 methods studied reached isometry in terms of maintaining a constant tension throughout passive stifle motion, potentially resulting in loss of suture tension at some joint angles with consequent joint instability. There is little information about the precise joint angle at which the suture should be tightened. For any suture fixation that is not isometric, securing the loop at a joint angle when the lateral suture loop is longest will result in the least increase in suture load during range of motion, but may allow some joint laxity during range of motion of the stifle. If the suture is tied at a joint angle when the loop is shortest, tightening will occur during range of motion potentially over-constraining the stifle and promoting early suture break down. Surgical texts mostly recommend tightening the suture at slight flexion of the joint or at a normal standing angle. A survey of veterinary surgeons revealed that 67% positioned the stifle at 140 degrees when the suture was tied, full joint extension was preferred by 19%, and only 5% had the stifle at 90 degrees of flexion, confirming the divergent opinions with regard to which angle might result in the best balance between MPL and maximal negative load (MNL). Clinically, tightening the suture at an angle between 100 and 135 degrees may reduce MPL on joint flexion, potentially limiting stretch of the suture-knot construct and therefore early destabilization of the joint. At the same time, this angle would preserve most of the tension within the suture when extending the joint. In summary, both the angle of flexion chosen while tightening the suture as well as the suture attachment sites when performing LSS changes the pattern of tension within the suture throughout a full range of stifle motion. However, regardless of LSS technique, a significant increase in suture tension occurs on flexion of the joint increasing the risk of suture breakage and irreversible stretch. This unwanted peak in tension on flexion of the joint might be reduced when tightening the lateral suture in a greater degree of extension. Lateral suture stabilization (LSS) techniques performed in stifles using an 80 lb nylon leader line and a custom made crimp. (A) Traditional technique according to Flo (LSS1); (B) modification of LSS1 with 2 parallel drill holes at the tibial crest (LSS2); (C) distal attachment of the suture through 2 divergent drill tunnels at the Gerdy’s tubercle (LSS3); and (D) distal attachment at the Gerdy’s tubercle. Proximal attachment with a bone anchor placed into the caudolateral cortex of the lateral femoral condyle, at the level of the distal pole of the lateral fabella (LSS4). In an attempt to further refine LSS techniques, an extracapsular suture stabilization technique called the TightRope CrCL technique (TR), was developed in an attempt to address perceived shortcomings of the current techniques, and to specifically incur minimal morbidity, address all aspects of CrCL deficiency, allow for repeatable placement in the most isometric position possible, and consistently result in successful functional outcomes with low overall and major complication rates in a cost effective manner. The TR CrCL extra-articular stabilization technique was developed to provide bone-to-bone fixation of the prostheses using a stiff prosthetic material. Femoral and tibial bone tunnels are used to place a fiber tape prosthesis across the lateral aspect of the stifle. The suture is anchored to the femur and tibia using toggle buttons placed at the medial orifices of the bone tunnels. The primary stimulus for development of the TR technique was patient safety, specifically low morbidity as well as rate and severity of complications. 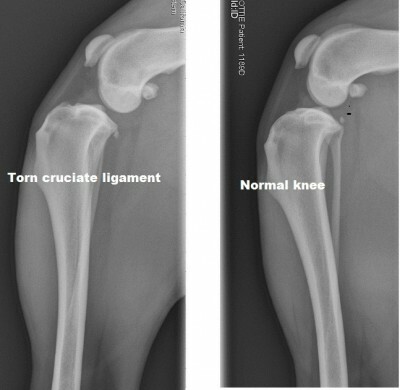 Some studies have indicated that tibial osteotomy procedures (TPLO, TTA) are associated with higher and more severe complications in dogs undergoing surgery for CrCL deficiency when compared to other techniques. In a recent study comparing TPLO to TR, TPLO was associated with numerically higher major and total complication rates compared with TR, but these differences were not statistically significant. However, surgery and anesthesia times were significantly shorter for TR compared with TPLO, which is consistently associated with lower morbidity. The other preclinical aspect of the development of the TR technique was comparative mechanical testing. In this study, the TR device proved superior for all variables examined. The biomaterial used for the TR procedure is a Kevlar-like material which is currently used extensively in the human field for many orthopedic applications. This material has properties that make it stronger and less prone to failure than any other suture materials currently being used in LSS CrCl reconstructions. These superior mechanical properties combined with the theoretical advantages of bone tunnel fixation in both femur and tibia suggest that the TR technique may have potential advantages with respect to stifle stability and joint kinematics during formation of periarticular fibrosis compared with LSS techniques which rely on soft tissue fixation or point-fixation. However, clinical comparisons among LSS extracapsular techniques or in vivo assessment of joint kinematics after any of the surgical techniques used to address CrCL deficiency has yet to be performed. These data from this study suggest that the TR CrCL technique can be successfully performed in medium, large, and giant breed dogs with CrCL deficiency and result in 6-month outcomes which are not different than TPLO in terms of degree and level of pain and function, as well as subjective assessment of radiographic progression of OA. Duration of anesthesia and surgery was less for TR than TPLO and major and overall complication rates were lower for TR compared with TPLO. The TR technique is safe and effective and can be considered as a viable choice as part of the overall treatment plan for CrCL deficiency in dogs. The technical aspects of TR were a major consideration for clinical application from its inception. The toggle fixation mechanism and the use of guide wires placed using consistent anatomic landmarks followed by cannulated drilling allow the TR device to be safely placed such that the functional fixation points are in locations similar to those determined most isometric for the lateral aspect of the canine stifle based on radiographic assessment. Figure 1 Illustrations of a canine stifle with the TightRope CCL implant positioned and viewed from the cranial (A) and lateral (B) aspects. T, tubercle of insertion of the biceps tendon/iliotibial band (tubercle of Gerdy); L, tendon of origin of the long digital extensor muscle. Despite widespread use of LSS stabilization in dogs, only a few studies have evaluated the biomechanical effects of this procedure. It would be important to define contact mechanics in stifle joints after LSS stabilization to understand and refine surgical treatment of CrCL insufficiency in dogs. 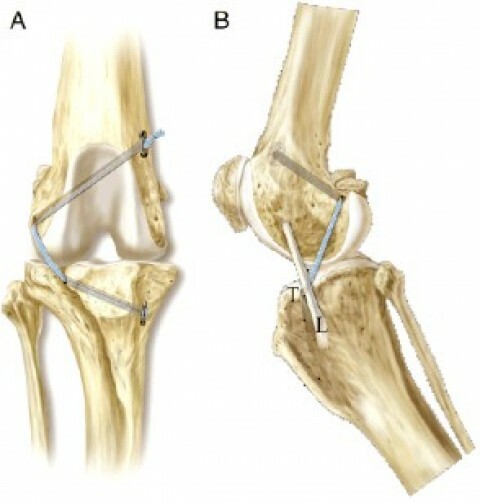 Tension placed on anterior cruciate ligament grafts in people is widely accepted to be an important biomechanical factor influencing procedure success. Excessive tension can cause premature failure of the prosthesis, whereas insufficient tension may not provide adequate joint stability. Appropriate suture tension should neutralize cranial tibial thrust while allowing a normal range of motion, and restore normal kinematics and contact mechanics to the CrCL-deficient stifle. Results of a recent study confirmed that over tightening an extra-articular prosthesis when performing either TR or LSS stabilization technique increased lateral compartment pressures in the stifle joint, but lateral compartment pressure normalized when an axial load was applied to the joint. Nevertheless, the significant increase in contact pressure at higher suture tensions tested in the unloaded stifles would suggest excessive tightening of an extra-capsular prosthesis might result in elevated contact pressures during the early convalescent period after surgery, when dogs typically place limited weight on the affected hind limb. Early weight bearing after extra-articular stabilization of the CrCL deficient stifle may be important to resolve abnormalities in contact mechanics and kinematics, which were evident in this study. That study also established that extra-articular stabilization induced significant excessive external rotation of the tibia. 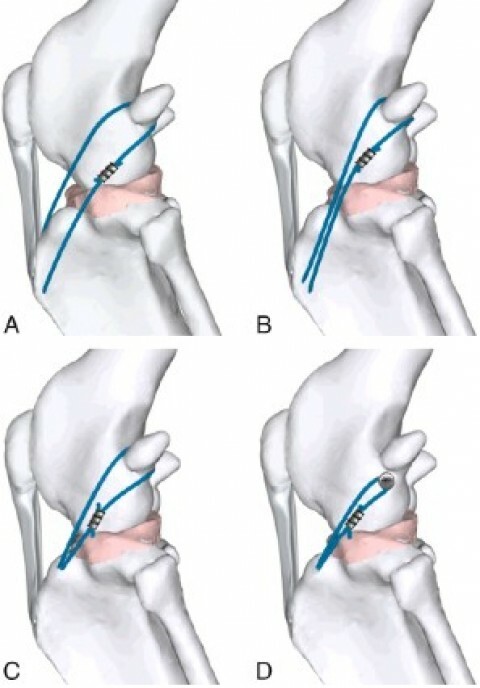 It is likely that any extra-articular reconstruction technique causes malalignment of the femorotibial joint which may be mitigated during loading the stifle; however, an in vivo kinematic analysis would be needed to confirm that stifle alignment would return to normal with weight bearing. Ideally a prosthesis mimicking the CrCL should be secured at isometric locations, so that the distance between points of attachment remains constant as the stifle moves through a range of motion. Isometry of suture placement would prevent laxity or over constraint of the joint at different flexion angles. However, an extra-capsular prosthesis can never be truly isometric because the stifle does not function as a pure hinge joint. Tightening an extra-articular prosthesis in an effort to stabilize the joint eliminates the normal motion of the femur and tibia. In addition, alterations in the instant center of rotation may change the direction of surface velocity, causing compression of the joint surfaces at their point of contact. Results of this study substantiate that excessive tensioning of the extra-articular prosthesis is detrimental to lateral compartment contact pressures. The non-isometric placement of prostheses, such as in the LSS or TR techniques, could result in excessive or ineffective prosthesis tension at different joint angles. Ligament prostheses are high load-bearing structures that are subjected to impact loading. High loads caused by excessive postoperative activity, or severe joint instability may predispose to early elongation of the prosthesis. An over-tightened prosthesis cyclically loaded outside the range of its tolerance may loosen with weight bearing and have no impact on lateral contact pressures. Many variables such as variations in weight bearing, degree of periarticular fibrosis, stifle conformation, presence of meniscal pathology and meniscal treatment, body weight, and activity level would influence the cycling of an extra-articular prosthesis. In summary, over tightening of an extra-articular prosthesis, regardless of technique, can increase lateral compartment contact pressures when the stifle is unloaded. The optimal tension for TR and LSS is difficult if not impossible to define because of the many mechanical and biologic factors that may influence the effects and properties of the tensioned suture. None the less, tensioning an extra-articular prosthesis should be done cautiously. This finding is supported by a previous study that found that dogs that had satisfactory limb function after LSS had more cranial drawer motion and a greater range of motion than dogs that did poorly. In this study, the effect of tension was eliminated by axial load, suggesting that early weight bearing may mitigate abnormalities in contact pressures caused by excessive tension of an extraarticular prosthesis. Increasing interest has emerged in use of tibial osteotomies for treatment of cranial cruciate ligament insufficiency in dogs. Rupture of the CrCL causes stifle instability, which predisposes the meniscus to injury and the stifle to degenerative joint disease. Loss of integrity of the CrCL results in an unrestricted cranial femorotibial shear force causing tibial subluxation during weight bearing. Tibial osteotomies impart dynamic stability by altering the geometry of the stifle and thereby neutralizing the cranial femorotibial shear force. Dynamic stability can be achieved by decreasing the slope of the tibial plateau or by advancing the tibial tuberosity. Tibial plateau leveling osteotomy (TPLO) imparts craniocaudal stability by reducing the tibial plateau angle (TPA), whereas tibial tuberosity advancement (TTA) eliminates cranial tibial thrust by advancing the insertion of the patellar tendon and modifying the angle between the medial tibial plateau and the patellar tendon, which defines the patellar tendon angle (PTA). Despite widespread use of these osteotomy techniques, a perspective of how they affect both TPA and PTA has not been established. In 1983, Slocum described the internally generated femorotibial shear force that causes cranial tibial translation as cranial tibial thrust. Slocum’s theory suggests that the magnitude of cranial tibial thrust is dependent upon the angle between the tibial plateau and the joint compressive force, which was purportedly directed parallel to the tibial axis. Slocum proposed that the tibiofemoral shear force or CrTT was an internally generated force that caused the tibia to translate cranially (and is opposed by the CrCL). Slocum proposed that the CrTT in the normal stifle joint was primarily controlled by the caudally directed forces of the hamstring muscles. In this theory, the compressive forces across stifle joint were proposed to be parallel to the tibial axis, but because of the caudally directed TPS, compression between the joint surfaces resulted in cranial tibial translation. This theory was developed as the active model of the stifle; CrTT is created by compression between the femur and tibia, which acts through the functional axis of the tibia, and is dependent upon the amount of compression and the TPS. Axial compression of the limb is thought to generate a compressive force across the joint, and this resultant force can be reduced to 2 orthogonal components, one perpendicular and one parallel to the tibial plateau, the latter representing the CrTT . The CrTT is a result of the tibial plateau oriented at an angle to the axial compressive force. If the angle of the tibial plateau is reduced to zero, the joint compressive force and resultant force become the same, as the CrTT becomes zero, as this force vector is eliminated. Clinically, however, the plateau is not returned to 0 degrees, but has approximately 5 degrees of remaining slope. This concept relies on the hamstring muscles, which contribute to neutralizing this small remaining force. More recently, some researchers have suggested that the sum of the forces acting around a weightbearing stifle is directed parallel to the patellar tendon. Cranial tibial thrust, according to this model, is thus dependent on PTA. This model demonstrated that the tibiofemoral compressive force was approximately of the same magnitude, and oriented in the same direction, as the patellar tendon force, which resulted in a variable tibiofemoral shear force. This force was either anteriorly or posteriorly directed dependent upon the angle of knee joint extension or flexion, respectively. The point of neutral tibiofemoral shear force was termed the crossover point in this model, which occurred at a patellar tendon angle (angle between the tibial plateau and the patellar tendon; PTA) of 90 degrees. Therefore, it was proposed that the direction and magnitude of the tibiofemoral shear force was determined by the PTA. Methods for measuring PTA have been reported using anatomic landmarks of the plateau segment (PTATP) or by estimating a tangent to the femoral and tibial condyles at their point of contact (PTACT). The method using the common tangent is stated to be more accurate because it estimates the inclination of the tibial plateau at the contact point between the femoral and tibial condyles. The common tangent is an estimation of the inclination of the plateau at the point of articulation between femur and tibia. Factors that may influence PTACT include the point of contact of the femoral condyle relative to the tibial plateau as well as the surface geometry of the plateau, which are ignored when making TPA measurements. Previous theoretical analysis demonstrated the importance of the radius of curvature of the tibial plateau in predicting forces along the cruciate ligaments. As previously suggested, PTACT may be a better measure for pre-operative planning of tibial osteotomies. Further clinical studies are needed, however, to evaluate the applicability and repeatability of using the PTACT to determine plateau rotation during TPLO, and to determine if TPLO rotation based solely on the PTACT will yield functional stability. tibial plateau leveling osteotomy (TPLO). The resultant compressive force (large white arrow) across stifle joint is parallel to the tibial axis. Using the tibial plateau slope (TPS) as the baseline, whereby the femur can move along this surface if the cranial cruciate ligament (CrCL) is deficient, the resultant force can be broken down into its 2 orthogonal components (small shaded arrows), one perpendicular and one parallel to the tibial plateau. The latter represents the tibiofemoral shear force (resulting in cranial tibial thrust [CrTT]). If the angle of the tibial plateau is reduced to zero, the tibiofemoral shear force vector becomes zero, and the joint compressive force and resultant force become one and the same. The CrCL-deficient stifle is stabilized at a PTA of 90 degrees achieved with TTA when the stifle is positioned at a standing flexion angle of 135 degrees. This model takes into consideration both extensor mechanism anatomy and the geometry of the articulating surfaces of the stifle and therefore differs from Slocum’s theory in that the direction of the joint reaction force is dependent on the inclination of the patellar tendon. The primary difference between the 2 proposed mechanisms is the direction of the tibiofemoral compressive force. With TPLO, the force is proposed to be parallel with the tibial long axis, whereas with TTA it is proposed to be parallel to the patellar tendon. 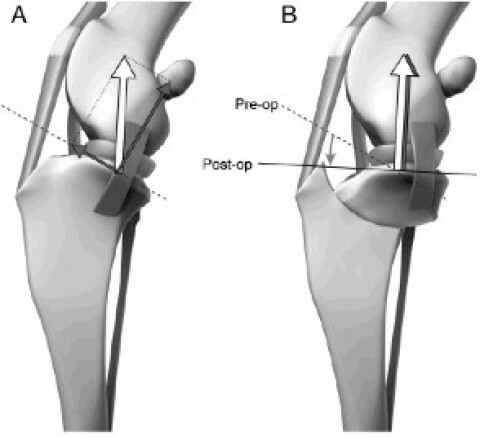 Variations in morphology of the proximal aspect of the tibia, and specifically patellar tendon insertion angle, may be relevant for preoperative planning of tibial osteotomies. Recently, it has been suggested that the proposed theoretical mechanism of action of the TTA can also be used to explain the mechanism of action for TPLO. Understanding how TPLO affects both TPA and PTA may provide insight about the mechanism of action of TPLO. In a recent study, the planning of TPLO rotation using the preoperative TPA or PTATP would have resulted in similar magnitude of plateau rotation. Variations in tibial tuberosity morphology in certain breeds, such as chondrodystrophic dogs, however, could influence the surgical planning of plateau rotation based on PTA. In addition, this study indicated that a PTACT of 90 degrees is achieved at a TPA of 12 degrees with the stifle in 135 degrees of flexion. This finding may help to explain the observation that dogs with TPA less than or equal to 14 degrees after TPLO had clinically acceptable results. Based on the calculation of PTACT, the point where the femorotibial shear force is neutralized corresponds to a plateau rotation lower than previously recommended. This result would support the speculation that TPLO to a TPA of 6 degrees overcorrects the cranial tibial thrust because of excessive rotation. The excessive rotation may explain the abnormal femorotibial contact mechanics that results after TPLO which may predispose to osteoarthritis. Performing TPLO rotations based on calculations using PTACT might result in less plateau rotation and mitigate the adverse alterations in femorotibial contact pressures previously reported. 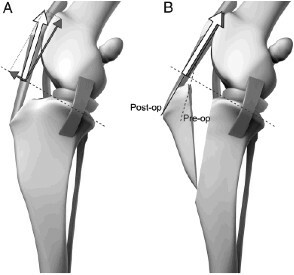 Schematic representation in the stifle joint of the tibiofemoral forces before (A) and after (B) tibial tuberosity advancement (TTA). The resultant compressive force (large white arrow) across stifle joint is parallel to the patellar tendon. Using the tibial plateau slope (TPS) as the baseline, whereby the femur can move along this surface if the cranial cruciate ligament (CrCL) is deficient, the resultant force can be broken down into its 2 orthogonal components (small shaded arrows), one perpendicular and one parallel to the tibial plateau. The latter represents the tibiofemoral shear force (resulting in cranial tibial thrust [CrTT]). If the angle of the tibial tuberosity is advanced cranially until the patellar tendon angle (PTA, angle between the tibial plateau and the patellar tendon) is reduced to 90 degrees, the tibiofemoral shear force vector becomes zero, and the joint compressive force and resultant force become one and the same. Presence and progression of radiographic changes of OA in the stifle joint of the CrCL deficient dog has been reported after conservative treatment and after extracapsular or intracapsular substitution techniques, TPLO, and TTA. Radiographic soft tissue changes include joint effusion/capsular thickening, lateral and medial soft tissue thickening, intraarticular osseous fragments, and meniscal mineralization. Bony changes include osteophytosis and enthesiophytosis, subchondral sclerosis, subchondral cyst formation, and joint space narrowing, generally placing emphasis on presence and growth of marginal osteophytes. Patellar ligament thickening and patellar tendinosis have also been observed. Surgical techniques that change the geometry of the proximal aspect of the tibia, such as TPLO and TTA were specifically developed to restore functional stability of the stifle, prevent deterioration of the medial meniscus, and reduce the degree of secondary OA in the stifle joint with CrCL rupture. The initial hope that progression of OA could be minimized using these techniques has not been consistently realized. Whereas progression of OA is less in dogs after TPLO and TTA than after extracapsular stabilization, in general, progression of OA has been observed after both TPLO and TTA. Several studies have reported or suggested a lack of significant correlation between the radiographic appearance of OA and clinical evaluation of limb function. A recent study evaluating the presence of OA and limb function found that limb function, characterized by force plate analysis, improved markedly after TPLO and TTA in spite of the fact that OA characterized by bony changes progressed in approximately 55% of the treated stifles. The degree of radiographically visible OA and the progression of bone and soft tissues changes after TPLO or TTA did not correlate with functional outcome assessed by ground reaction forces. Therefore, radiographic scoring systems may not necessarily reflect the true severity of OA. Historically, much emphasis has been placed on the presence and degree of osteophytosis in evaluation of the clinical status of canine joints and the presence and progression of OA has been suggested as a true test of the value of the treatment of the injured CrCL. For this reason, control of OA has been listed as one of the primary surgical goals of repair of CrCL injury. However, achieving this goal remains elusive and this and many other reports note progression of OA after stabilization despite an acceptable clinical outcome. Despite the differences in proposed mechanisms of action, clinical results appear comparable between TPLO and TTA. As previously mentioned, an argument could be made that the proposed mechanism of action for TTA can also explain the mechanism for TPLO. This can be observed after reduction of TPA via radial osteotomy and rotation of the proximal tibial fragment, as this also reorients the patellar tendon angle to less than or equal to 90 degrees. Obviously, different techniques are used to approach this mechanism from 2 different perspectives: (1) a radial cut of the proximal tibial plateau segment for TPLO, and (2) an osteotomy of the tibial crest performed in the frontal plane for TTA. For TPLO, the tibial plateau is moved to meet the force; alternatively, for TTA, the force is moved to meet the tibial plateau. In either case, it appears that the end result is the same: the tibial plateau and the patellar tendon become oriented at approximately 90 degrees to each other. Success rates with CrCL repair are reported to be greater than 90% regardless of the surgical technique used. Historically, selection of a surgical technique has been based primarily on surgeon preference rather than definitive evidence that one technique might be better than another. 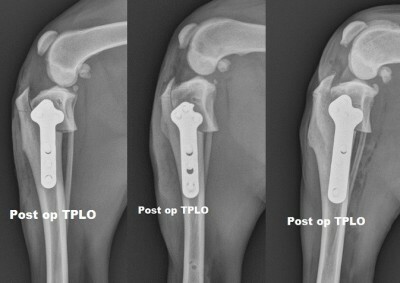 Unfortunately, there is no study that demonstrates that TPLO is a better procedure than, for example, the extra-capsular stabilization; this despite much anecdotal opinion that the TPLO is a superior technique, especially for active, athletic dogs. Likewise, there are no data for functional evaluation of TTA other than similar anecdotal evidence that it is an effective technique in similar types of affected dogs. There are no peer-reviewed reports comparing the outcome of TPLO to TTA; however, anecdotal comments have been presented. The question that is raised is whether one or the other of these techniques (TPLO or TTA) might be a better choice for repair of the CrCL-deficient stifle joint, and if so, under what conditions would one choice perhaps be better than the other. If it is accepted that tibiofemoral shear force is dependent upon the PTA (for either technique), then altering the direction of the patellar tendon force is the mechanism for obtaining dynamic joint stability. Based upon the proposed directions of the total joint force, either parallel to the patellar tendon (TTA) or to the functional axis of the tibia (TPLO), there may be a difference of as much as 10–15 degrees in endpoint after surgery. Based on this argument, it would appear that the TPLO overcorrects for the cross-over point compared with TTA. This proposed difference between the 2 techniques might be less than 10–15 degrees because of the craniocaudal translation of the femoral condyles and the contact point with the tibia during flexion/extension. During extension, the femorotibial contact point moves cranially; similarly, during flexion, it moves caudally. The effect of this varied positioning is yet to be evaluated, but a suggestion has been made that it should be considered when assessing the joint forces. These anatomic changes further minimize the difference between the calculated endpoints between the 2 techniques, perhaps only 5–10 degrees. The difference in endpoints after surgery raises the question as to whether it has any potential adverse effects. Because the primary stabilizer of the joint becomes the CaCL after either TPLO or TTA, could this theoretical difference put the CaCL at greater risk for subsequent injury with TPLO? It has been reported that the CaCL undergoes marked morphologic changes in CrCL-deficient joints, which may result in compromised material properties. Regardless, there is no clinical evidence that the CaCL is at risk for failure after either TPLO or TTA. There is only anecdotal information as to the risk to the CaCL with over-rotation of the tibial plateau with TPLO. From a theoretical standpoint, TTA would be correcting the tibiofemoral shear force closer to a neutral tibiofemoral shear force at full extension (approximately 135 degrees) during weight bearing, thus there may be less stress placed on the CaCL. It should be mentioned, however, that there is still no documentation as to the ideal point at which tibiofemoral shear is neutralized with either TPLO or TTA, and which of these techniques comes closer to this theoretical point. More information is needed about the possible risks to the CaCL over time, especially in its new role as the primary stabilizer to the joint. Another point to consider is whether or not an anatomic alteration of the tibial plateau angle when performing a TPLO makes a functional difference with regards to altering the gait and/or placing additional stress upon the menisci because of this change in joint orientation. The tibial plateau remains unaltered with TTA, whereas with TPLO, the tibial plateau is effectively placing the joint in approximately 15–20 degrees of increased flexion. Based upon kinematic gait analysis, stifle and hock mechanics remain unaltered with TPLO during weight bearing; however, some changes can be seen in the swing phase of the gait. Therefore, gait seems to be unaltered with TPLO, assuming that the alterations observed in the swing phase have no functional or clinical ramifications. This assumption appears to be reasonable based upon the absence of weight bearing during this time frame. It has been theorized that because TTA does not alter the orientation of the articular surfaces, there would be no effect on gait; however, to date there has been no similar evaluation of gait with kinematics. Any alteration of the point of insertion of the patellar tendon into the tibia and any effect on gait mechanics remain to be investigated. After TPLO, the femoral and tibial articular surfaces are placed in a relatively increased flexed position. Altered flexion of these surfaces during weight bearing results in changes in the pressure distribution to the caudal compartments of the joint (medial greater than lateral), possibly affecting the menisci (especially the medial meniscus); this altered positioning may also reduce the space for the meniscus. Both factors may place the meniscus at a greater risk for injury. This was the rationale to perform a medial meniscal release when performing a TPLO. More recently, however, it also has been shown that performing the meniscal release, or caudal pole hemimeniscectomy, in a CrCL-deficient stifle joint with a TPLO further changes and increases the pressure distribution in the medial compartment of the joint, an argument that would perhaps favor leaving the meniscus intact. Although there is no evidence that the increased stifle joint flexion predisposes the menisci to damage, it was proposed that TTA might provide less risk for such damage because of the unaltered joint position. This led to the original recommendation to leave the intact menisci in situ when performing TTA. To summarize, some studies seem to suggest that the caudal pole of the medial meniscus is at risk for trauma after TPLO, whereas not after TTA because the TTA does not change the geometry of the joint and the pressure distributions essentially remain unchanged. Debate remains as to whether or not to perform a medial meniscal release in both TPLO and TTA. An important argument to preserve the menisci has to do with the important biomechanical functions of the meniscus and the role of this structure to stabilize the joint. The meniscus functions as a load-bearing structure to distribute the femoral condyle forces more uniformly over the tibial plateau. Meniscal release eliminates this function and results in increased areas of localized stress to the articular cartilage. As previously noted, there are studies that indicate that preserving the meniscus with either TPLO or TTA better preserves joint mechanics in the CrCL-deficient stifle joint and these studies suggest leaving the meniscus intact if it is uninjured. Alternatively, as the meniscus acts as a secondary joint stabilizer in the CrCL-deficient joint, with any persistent passive laxity the caudal pole of the meniscus may be more easily injured with a failure to fully neutralize the tibiofemoral shear forces. Sparing this structure from injury by performing a meniscal release has been suggested. However, it has also been noted that performing a meniscal release does not completely eliminate the possibility of subsequent meniscal tears. It has been reported that after TPLO with meniscal release, there is cartilage damage present on the tibial plateau and medial femoral condyle, confirming that subsequent articular cartilage damage does occur. These changes have been attributed to both iatrogenic surgical injury when performing the meniscal release as well as to loss of normal meniscal function. However, it has also been stated that there is little outward evidence of clinical dysfunction as a result of these changes, which is consistent with most clinical impressions. Despite the progressive effects of osteoarthritis in these dogs, clinical dysfunction is considered minor as opposed to that occurring with an injured meniscus; therefore, this argument supports the meniscal release in favor of possible future meniscal impingement. The question is the unknown frequency of meniscal injury at initial surgery, and the number of undetected tears at that time as opposed to tears occurring after surgery. These meniscal injuries have been defined as either latent (undetected) or postliminary (subsequent) tears. A recent study evaluating the rates of meniscal injuries in a consecutive series of 1000 dogs receiving TPLO surgeries indicated an incidence of primary meniscal injury (PMI) of 33.2%, and subsequent meniscal injury (SMI) of 2.8%. In this study, complete CrCL rupture was associated with higher incidence of PMI than partial CrCL rupture as previously reported. This supports a mechanically protective effect of the remaining portion of CrCL in partial tears. Meniscal release was not performed for menisci of normal appearance and texture in this case series because it was considered that the relative risk of SMI was more acceptable than potentially subjecting all dogs to more severe focal cartilage wear that might be anticipated after MMR or partial meniscal resection. Many recent studies have independently confirmed that medial meniscal release eliminates the function of a crucial articular structure and therefore is in contradiction with the principles of surgical stabilization of CrCL deficient stifles as it is likely that a combination of inflammatory and degradative mediators originating from the transected meniscus and biomechanical abnormalities from the surgically induced loss of meniscal function play a key role in the development of cartilage degeneration after MMR. There is also the question as to whether the altered anatomy created by either of the procedures could result in other anatomic or functional changes within the joint. There have been a number of reports of patellar tendon thickening, or even patellar tendinitis after TPLO. It has been proposed that by rotating the tibial plateau, greater stress is placed on the patellar tendon compared with decreased stress to this structure after performing a TTA. The proposed increased stress (TPLO) versus decreased stress (TTA) on the patellar tendon can theoretically be explained by the change in lever-arm lengths to the patellar tendon after the osteotomies. If one considers that the CaCL becomes the primary stabilizer to the joint after either TPLO or TTA, the lever arm to the patellar tendon is the distance between the femorotibial contact point to the point of attachment of the patellar tendon to the tibial tuberosity. For TPLO, it is thought that this lever arm can shorten by as much as 10% compared with the intact joint, whereas, with TTA this lever arm can lengthen by as much as 10%. A shorter lever arm requires more force to move an object the same distance; conversely, a longer lever arm requires less force to similarly move an object. In this case, the object is the tibial tuberosity and the force is the quadriceps muscle pull on the patellar tendon. In other words, more force is required to extend the joint with a TPLO, and less force is required with a TTA. Regardless, there are no known clinical ramifications in dogs with mild to moderate patellar tendon thickening after TPLO, although a small percentage of dogs with severe patellar thickening have clinical signs consistent with patellar tendinitis. Regardless, there are no specific studies that have investigated this issue, clinically or experimentally, much less comparing the different techniques and their potential ramifications. Both the TPLO and TTA are complex procedures, requiring appropriate preplanning and accurate execution of the details of the procedure. Preoperative planning for the TPLO must include a proper assessment of the angle of the TPS, such that precise surgical execution results in the desired postoperative TPA of 5-6.5 degrees. Preoperative planning for a TTA must include a proper assessment to ensure that advancement of the tibial tuberosity results in a PTA of 90 degrees. It is suggested that there is some variability in the postoperative outcomes with the TPLO and TTA despite an attempt to obtain precise preoperative measurements. With both TPLO and TTA, there probably is some amount of postoperative variability that will be tolerated, but the ideal clinical postoperative PTA or TPS is unknown. As described, TPLO is a relatively invasive procedure where there is abundant circumferential dissection of the entire proximal aspect of the tibia, and a greater potential for injuring some vital structures around the joint. The substantial soft tissue dissection and limited coverage in the area of the proximal tibia may contribute to dead space and may predispose dogs to incisional complications. In addition, there are a number of surgical technical errors that can occur with TPLO. Placing the osteotomy too far cranial and/or distal will result in a higher than expected TPA postoperatively, and inadequate neutralization of the CrTT. Such malposition of the osteotomy also results in a small tibial tuberosity fragment, creating the possibility of a tibial tuberosity fracture. Placing the temporary holding pins (after initial rotation of the tibial plateau) too far distally into the tibial tuberosity may result in a stress-riser in this fragment, again predisposing this bone to fracture. Fibular fractures can result in excessive stresses placed on this structure during the rotation, or may occur as a result of stress-risers from drill holes into this structure. The TTA is considered by many to be a simpler procedure than the TPLO. Similar comments regarding soft tissue dissection and limited coverage in the area of the proximal tibia may be made for TTA; however, the surgical dissection is confined to the cranial portion of the bone. There is much more limited possibility for iatrogenic surgical injury with TTA, but damage to the long digital extensor tendon is one potential consequence. There are a number of surgical technical errors that can occur with TTA. These issues include too small of an osteotomy fragment, shifting the patella distally, or predisposing to a patellar luxation with improper tibial tuberosity repositioning. A small osteotomy fragment does not allow adequate fork purchase as there is insufficient bone available. Another potential error is patellar malposition. Patellar luxation can result if attention is not paid to the plate contouring, ensuring that the tibial tuberosity is advanced cranially without changing the orientation within the sagittal plane. Any shift either medially or laterally could result in a malalignment of the quadriceps mechanism, and thus the resultant patellar luxation. Other issues may include poor plate position, either rostrally along the tibial crest or distally along the tibial diaphysis. When comparing TPLO to TTA, the difference in implants could be considered: commercially pure titanium is the norm with TTA versus stainless steel with TPLO. Pure titanium is touted as a more biocompatible implant with tissues as compared with stainless steel. Furthermore, the plate profile with TTA is very thin and provides less overall bulk in a position on the limb where soft tissue covering is limited to a thin muscle layer and skin. This may play a role in limiting soft tissue complications. The use of locking screw technology compared with conventional screw technology in TPLO has recently been investigated. A distinct advantage of locking screws is their ability to function as an internal fixator and maintain accurate osteotomy reduction without having a perfectly contoured plate. With conventional screws, if the plate is not accurately contoured at the time of screw placement, osteotomy reduction can be disrupted as the screws are tightened to achieve bone–plate friction. Less initial tibial plateau disruption has been reported with locking screws compared with conventional screws. Locking screws better maintain initial rotation of the tibial plateau segment if small gaps occurred between bone and plate. According to this study, locking screw technology resulted in improved radiographic healing and TPA was better conserved when compared with similar fixation using conventional screw technology. Some factors specific to the anatomic configuration of the limbs being operated need to be considered, from the standpoint of conformational issues that would make one procedure perhaps the better choice than the other. These include angular and torsional limb deformities, patellar luxation, and excessive TPS. Furthermore, the size of the dog may also play a factor. When performing a TPLO, rotation of the tibial plateau segment only to the level of the patellar tendon insertion on the tibial tuberosity has been suggested to ensure its role as a buttress support for the tibial tuberosity segment. Therefore, dogs with high patellar tendon insertion point would run the risk of the rotation of the tibial plateau segment to a point below the patellar tendon insertion, thus potentially leaving the tibial tuberosity more prone to fracture because of an absence of buttress support. Alternatively, in dogs with a low patellar tendon insertion point, much greater rotation could be obtained while continuing to preserve the caudal buttress behind the tibial tuberosity. In contrast, the tibial tuberosity may be at more risk for possible fracture with TTA in cases with a low patellar tendon insertion point, as a smaller plate is applied to the tibial crest and the usual position of the interspersed cage is above the most proximal position of the plate with little bone present for support. In dogs with a high insertion point, a larger TTA plate can be applied to the tibial crest, and the interspersed cage is placed within the gap, which remains buttressed with adequate bone and a larger plate that disperses all the forces to the tibial crest. It is suggested that cases with a high patellar tendon insertion point are more conducive to a TTA, whereas cases with a low patellar tendon insertion point are better suited for a TPLO. In any case, there are no experimental or clinical studies reported that support these assumptions. Cases where there is excessive TPS are not conducive to TTA, because the procedure requires that the advancement produce a PTA of 90 degrees, which likely would result in a required amount of advancement beyond that obtained with the currently available implants. Additionally, there is a conformational deformity of the joint with excessive TPS that places it in a relative angle of hyperextension despite the limb itself not being in the extended position. TTA does not address this malformation, whereas the TPLO can correct it. The question remains, however, as to the maximal angle of the TPS that should be used as a guideline to consider whether to perform a TTA, although it has been proposed that angles greater than 27 degrees probably are not well suited for a TTA. Angular and torsional limb deformities may be treated with either TPLO or TTA; however, TPLO may be better suited to make these corrections simultaneous with the rotational osteotomy. The concept of modification of tibial plateau leveling osteotomy as a widely recognized management modality for canine CrCL insufficiency to include simultaneous correction of frontal plane deformity and/or torsional deformity of the tibia has been previously introduced. Such modifications are routinely used in dogs with preoperative tibial deformity in order to prevent subsequent development of postoperative gait abnormality or exacerbation of limb deformity during the TPLO procedure when the medial cortex of the calcaneus and the central patellar axis are not collinear in the sagittal plane. With minor angulation or rotation, these deformities can be addressed after rotation of the proximal tibial fragment, after it has been temporarily secured with a pin or K-wire, and before plate fixation. At this point in the procedure, an angular correction (stifle varus or valgus) can be performed by shifting the jig position along either the proximal or distal jig pin (a translation of the jig along the pin) so as to obtain limb realignment. Similarly, a rotational correction can be performed by bending one of the jig pins (usually the distal pin) while the jig is securely fixed to these pins. A recent study successfully utilized a TPLO with a medial opening crescentic osteotomy (TPLMOCO) in dogs with genu varum attributable to proximal tibia vara and/or tibial torsion. If a TTA was performed to correct the CrCL-deficient joint, a separate osteotomy would still be required. The disadvantage is that the medial side of the bone already has the plate positioned for TTA in the proximal one third of the medial tibial surface, which will interfere with subsequent additional medial plate fixation. Although a standard plate could be applied over the thin TTA plate, this is far from ideal and generally not recommended. Patellar luxation requiring tibial tuberosity transposition, on the other hand, may be better suited for a TTA, as any desired transposition could be simultaneously performed with the advancement. In this case, the TTA plate is slightly over-bent to conform to the new laterally (or medially) transposed tibial crest. The limitation with the tibial tuberosity transposition and TTA, however, would be cases of patellar luxation that also had a significant angular/torsional deformity that also needed to be corrected at the same time. In the latter instance, TPLO would again be the better choice. In this instance, if there was a simultaneous rotational deformity this correction could result in appropriate alignment of the tibial tuberosity after the repositioning. Both TPLO and TTA have been performed in dogs as small as 5 kg and as large as 92 kg. Size limitation for these techniques is dependent upon the availability of the appropriately sized implants. Both devices are produced in a variety of sizes such that they can accommodate almost any sized dog. One current limitation of the TTA may be the large distance of TTA that is required for some large breeds of dogs (not necessarily the heavier dogs, but rather the taller dogs, e.g., Great Danes). The widest cage currently available to support the osteotomy gap is 12mm. Whereas the cage can be moved further distally to increase the width of the gap, this must be done judiciously, as the tibial tuberosity above the cage may become prone to fracture because of a large stress-riser created above the cage. Early diagnosis of a CrCL injury and treatment by either TPLO or TTA may be protective against further CrCL disruption lending stability to the joint and decreasing the incidence of meniscal injury and articular cartilage damage. One study has indicated that in joints where initially there was only partial CrCL tear with most of the CrCL appearing normal, that the CrCL remained intact after TPLO and the intraarticular structures appeared normal or near normal. By contrast, joints that initially had either complete disruption or a partial tear with the remaining CrCL judged incompetent developed a range of pathologic changes including mild fraying or complete rupture of the caudal cruciate ligament, postliminary bucket handle tears of the caudal horn of the medial meniscus and visible cartilage lesions. These findings suggest that TPLO has a protective effect on injured CrCL when there is some initial fiber disruption but most of the CrCL is intact and appears functional. The protective effect may result from decreased stress on the CrCL after rotation of the tibial plateau and subsequent transformation of cranial tibial thrust to a caudal tibial thrust. The elimination of cranial tibial thrust would likely lower strain within the CrCL reducing the possibility of further fiber tearing. As the remaining CrCL maintains the relationship of the femoral condyles relative to the tibial plateau, i.e., centers the femoral condyles within the confines of the menisci, the effect is a decreased incidence of meniscal injury and articular cartilage damage. These findings support the notion of early surgical intervention for cruciate ligament disease and against debridement of CrCL fibers in early injuries because of good functional outcome and the apparent protective effect of surgery on the remaining CrCL. In conclusion, there are a number of apparent advantages/disadvantages in both TPLO and TTA procedures. TTA may correct the tibiofemoral shear force closer to the neutral point compared with TPLO, which might protect the CaCL from additional stress as the primary joint stabilizer. Another advantage of the TTA is the unchanged joint geometry and superior cartilage pressure distribution compared with TPLO. TTA may also be a less invasive, simpler surgical procedure with fewer potential technical issues with adverse effects. TTA may be more suitable in cases of patellar luxation. On the other hand, TPLO is a more versatile procedure than TTA in cases with excessive TPS, and in cases with a variety of angular and rotational limb deformities, including cases with concurrent patellar luxation. At this time, there are only a few studies that present reasonable scientific support for either procedure. A number of experimental and clinical studies are necessary to attempt to shed more light on these repair methods. In summary, the stifle joint of dogs is an organ comprised of multiple tissue types that must work in concert to maintain joint health and function. Cruciate disease in dogs is caused by a spectrum of causal and risk factors that result in a final common pathway of abnormal biomechanics and abnormal biology causing osteoarthritis of the stifle and the clinical signs of lameness, pain, and limb dysfunction. It is vital to understand the components of the biologic and biomechanical pathologies to improve our understanding of cruciate disease in dogs so that we can improve preventative, diagnostic, and therapeutic strategies for our patients. As veterinary surgeons, it is important to consider and address as many aspects of the disease as possible and educate clients well with respect to the nature and progression of CrCL disease, preoperative, operative, and postoperative treatment components and options, and their roles in achieving a successful outcome for their dog. While surgical intervention is recommended in dogs afflicted by CrCL insufficiency, there is no evidence to support the notion that any one technique is clearly superior to the others at this point in time. Not only is it unclear as to which surgical technique is superior, it is also unclear as to whether or not the remnants of the diseased cruciate ligament should be debrided and removed from the intrasynovial environment. It is equally unclear as to whether or not aggressive manipulation, inspection and release or removal of meniscal tissue should be performed. When analyzed collectively, the innumerable studies presently available for review on cruciate ligament and meniscal disease fail to definitively prove which one surgical approach has the best short term and long term success rate with consistent return to full, pain free function. As with many surgical procedures, it is at the discretion of the surgeon to select the technique that he believes is the most appropriate for the specific task at hand and their own experience/expertise.